What is the best way to search for standards? Standards generally have highly structured meta data, consisting of the title, abstract and the document number plus additional fields. The search technology on webstore.ansi.org is very different from Google and Bing. Autocomplete on Google and the webstore.ansi.org both begin recommending search terms when you begin typing a search query. Google recommendations are based on the popularity and the frequency of searches that ran before and may also be related to your past interests. Searching for “windows” on Google you might see recommendations or results for either the Microsoft operating system or Andersen replacement windows depending on your recent search history. Autocomplete on webstore.ansi.org is based on an alphabetic match to document numbers in the store catalog and it has nothing to do with past history or popularity. Document number searches on webstore.ansi.org really only query the document number field in the catalog database. This eliminates false positive matches in the case where other parts of related documents may mention the document number. But both the autocomplete function and the actual search are quite unforgiving if the number is not exactly formatted properly. By contrast, if you misspell, you may notice on Google and Bing, the phrases “did you mean” or “showing results for”. On Google, if you are looking for a standard, you may find related services or products intermingled with the actual standard you are looking for. That can be very helpful unless your present intent is simply to find the standard you need. So keep in mind, that the webstore.ansi.org is a vertical search engine specifically for standards and it relies on dashes, slashes and colons being entered exactly as they are used in the document. As an experiment, you might try to see how Google and Bing treat the query ISA-TR84.00.02-2002 with and without the dash. Google ignores the dash and presents the same results in both instances. Bing treats both queries differently and returns different search results in each case. On the ANSI webstore, entirely different results are returned depending on whether the dash is included or not. Slashes, dashes and colons are interpreted as literal characters on webstore.ansi.org. So searching for ANSI-ISA produces no results but searching for ANSI/ISA returns several documents. As a final example: if you were to search the webstore for ANSI/ISA 103.00.08, as you began typing, you’d see various autocomplete suggestions. But if you left out the slash and typed ANSI ISA 103, the search would fail as shown in the two screenshots below. 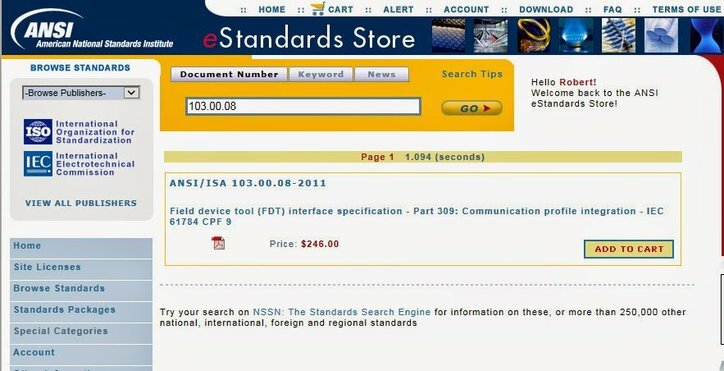 A secondary search box is presented, when the webstore returns no results. That search box uses a different search algorithm that isn’t sensitive to the dashes, slashes and other special characters. It broadens the search and may produce a wide variety of results. It often will return what you were looking for or at least can then show you the proper structure of the document number you are looking for. Another suggestion might be to search for the core designation, such as 103.00.08 as shown in the third screenshot below.